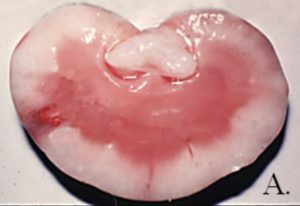 Etiology: The etiology of lymphosarcoma in rabbits is largely unknown but is likely multifactorial . Susceptibility to the disease is believed to be due to an autosomal recessive gene expressed in the homozygous state. 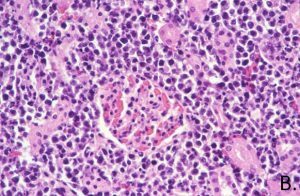 Incidence: Lymphosarcoma is the second most common neoplasm in rabbits. It is considered a tumor of juvenile and young adult rabbits. Clinical Signs: Clinical signs are non-specific and include anorexia, lethargy, diarrhea, rhinitis, and emaciation, depending on organ involvement . 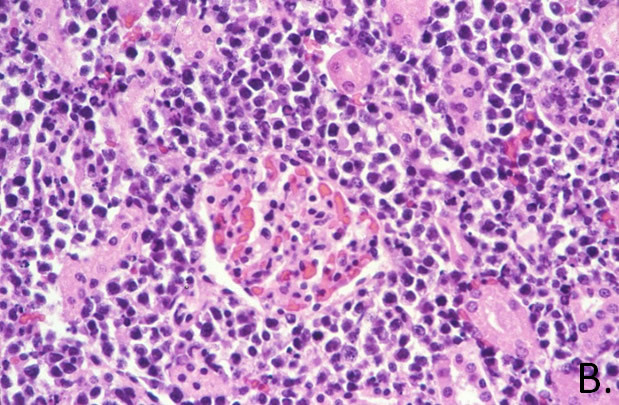 Histologically, lymphoblastic cells invade and obliterate organ structure (B. ).